One of a set of black bear triplets watches Mom looking for grubs under a rock. This was taken through my truck window in a very short window of opportunity. The light was getting low, and the bears were moving briskly in their hunt for food. From when we first saw them until the time they disappeared into the woods was only a minute or two. Moving around for ideal compositions was not an option... I was unable to get a shot with all four bears--the best I could do was a shot with all three babies. But I like this one, with the baby balancing on a log watching Mom look under a rock. I'm going to assume this was shot with my Canon 5D2 and 300/2.8. I can see why you like this one, Paul, even the small part of mother tells the story of why the cub is watching so attentively as she lifts the rock to search for snacks! Very cute balanced on that log, watching mom. Looks like it is getting a lesson in "grubbing". 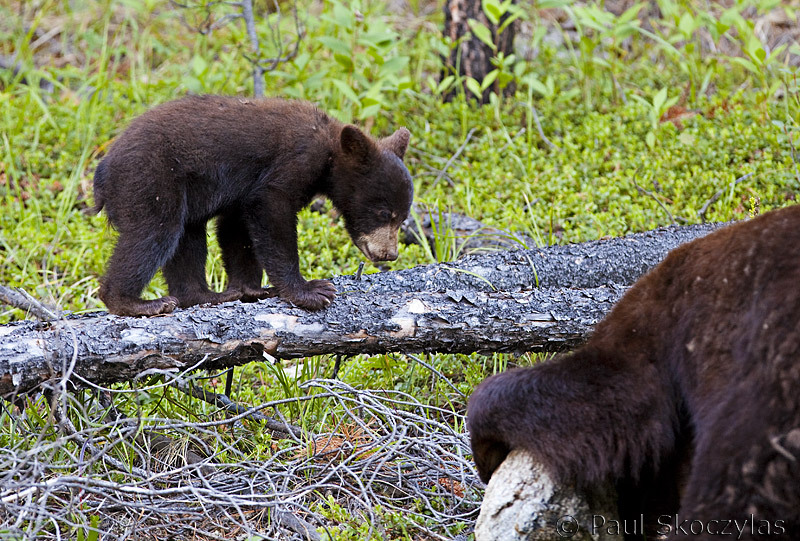 Hey Paul, the cub is perfectly posed on the branch. I had to study the view of mom a bit to discern what part of her anatomy I was viewing, but once I resolved that it makes perfect sense. Cubs walking on logs ... gotta love it!